The diagnosis of diabetes can at first be very overwhelming. Your mind may be filled with questions—questions about what diabetes is, how you can cope with it, and what the possible complications may be. But the truth is that if you are one of the many people who have type 2 diabetes—also called non-insulin-dependent diabetes—there are many things you can do to control your diabetes. My Doctor Says I Have a Little Diabetes was designed to help you do just that. 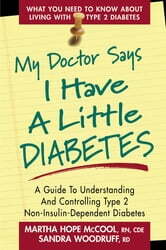 Written in easy-to-understand language, this book begins by explaining the basics of diabetes and diabetes care. The authors define exactly what diabetes is, and dispel many common misconceptions about this disorder. Each of the remaining chapters looks at a specific aspect of diabetes care. You’ll learn how to effectively monitor your glucose level, how to follow a diet that you can live with (and enjoy! ), and how to use exercise to maximize diabetes control and enhance your well-being. 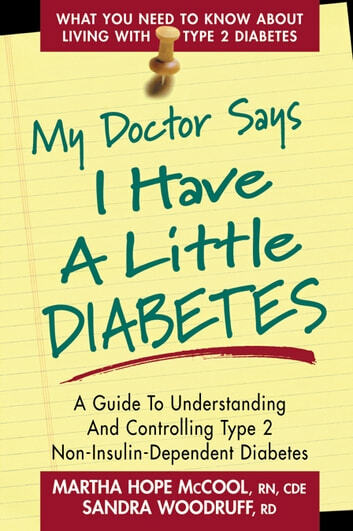 Still other chapters will help you master any diabetes medication you may be taking, assist you in understanding and controlling high and low blood glucose levels, and teach you to prevent complications. You’ll even learn how to handle special situations such as illness and travel. Medical researchers have discovered that good diabetes care does indeed make a difference. Let My Doctor Says I Have a Little Diabetes be your guide to living successfully with diabetes.